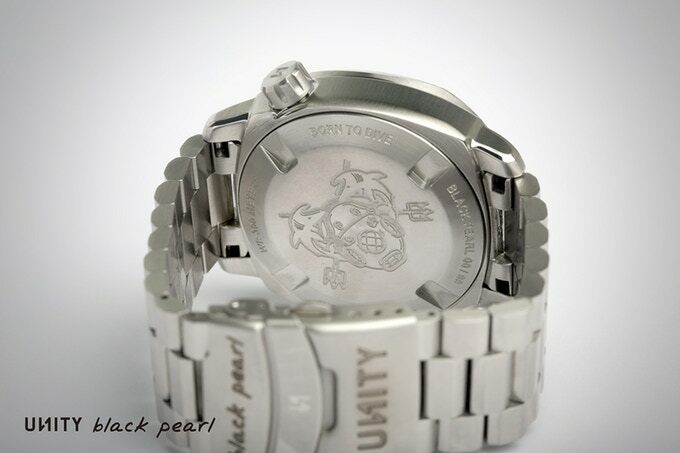 Unity Watches, who hail from Barcelona, Spain, have launched their third model, the Unity Black Pearl Diver. They chose to launch on Kickstarter this time, for some extra exposure. Some may not be familiar with the Spanish brand, but they have been making their own watches in house since 2010. When I say they have been making their watches in house, they are not only designing the watches but actually machining and assembling the cases in their shop in Barcelona. Even though they have been around for quite a few years now, they have been kind of a sleeper brand, as their first models were a little different in terms of style. Nothing wrong with them, I just do not think they hit the mark for everyone. The Unity Black Pearl Diver is custom made case and dial but it has the cushion case shape so many of us watch enthusiasts are familiar with, and should appeal to a wider audience. The Unity Black Pearl Dial is a 316 L stainless case that measures in at 43mm in width with a length from lug to lug of 51mm. This is a good size for most, it is not too large and not small either. 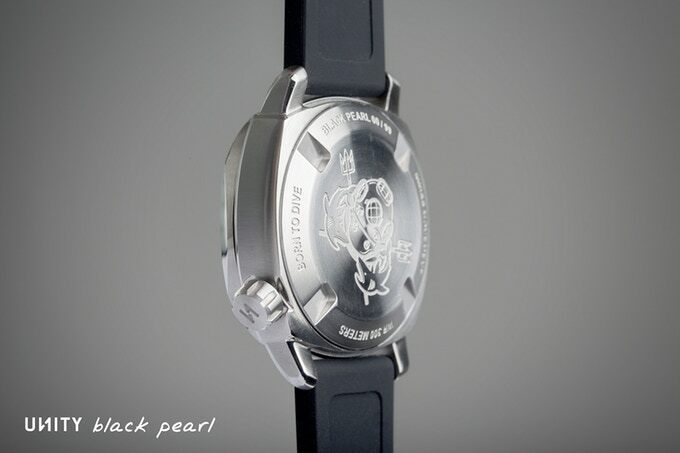 It is water resistant to 300 Meters and has domed sapphire crystal with AR coating. 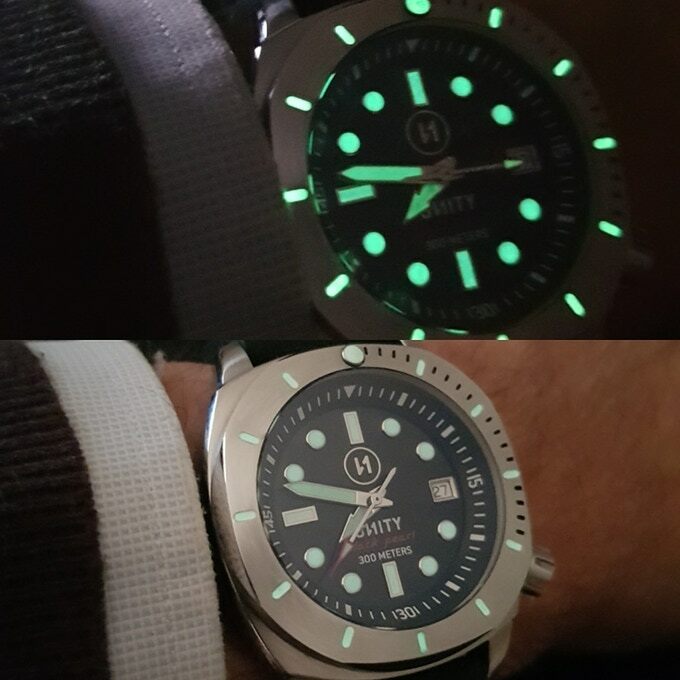 Dial hands, markers and bezel have all been coated with Super-luminova, as you would expect for a dive watch. Early Bird pricing comes in at $570 USD, and that gives backers the Black Pearl with a stainless bracelet, rubber strap with Pre-V buckle, strap tool and leather travel case. Delivery is scheduled for June 2018. It is always difficult for me to comment on a watch with never seeing it in person, but from the photos and video I see on their campaign, I like what I am seeing. I have always like the cushion case dive watches and the dimensions are right on target for what I wear these days. The hands are a little different for sure and look to be a little small for the dial, but that could just be the photos. The bezel reminds me a of Clerc watches, but not a complete copy, more inspired if anything. As I said above, I do not think Eduardo, owner of Unity, was trying to reinvent the dive watch with this release, but offer something that hits a larger audience. 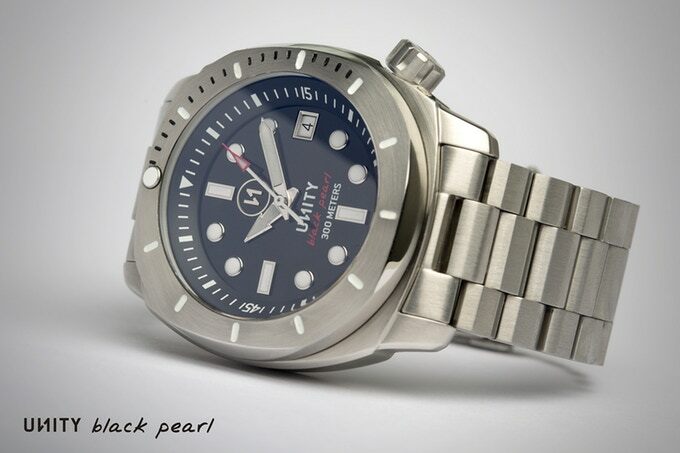 The choice of movement for the Unity Black Pearl Diver is not very well known, and that may give people some hesitation. I had a Unity Watch years ago with this movement and do not recall any issues at the time, but it was probably 6 years ago now. I do know Resco used to use the Valanvron V24, which is essentially a copy of the ETA 2824, built by Seagull out of China. The movement, to the best of my knowledge and research, is then sent to Switzerland to be reworked and assembled to get the Swiss Made label. It is a direct replacement for the ETA 2824, with the same dimensions and jewels. I like what I see, but that is as much as I can comment on. 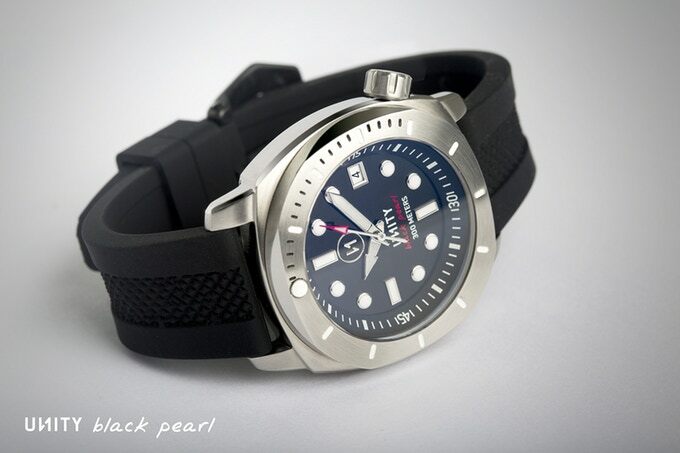 Hopefully when the watches are produced I can get a more hands on look, but until then, if you are interested in the Unity Black Pearl Diver, you can check them out on Kickstarter or their Website below. Does it seem odd that the movement is made in China but then sent to Switzerland? Does that keep costs down? Thanks. I assume it does keep costs down. It is a little misleading with the movement, but I guess if they follow Swiss Regulations, they can call it Swiss Made, but it is a weird one. But lets be real, who knows what goes on with say a SW200 movement or a STP1-11 movement etc. The bezel does not rotate, I take it? As far as I know, it rotates.